In previous chapters we explored “Courses and Products” and “Authentication and enrollments methods“. Once you are done setting up the courses and enrollment methods, you are ready to assign roles to staff members and add learners. 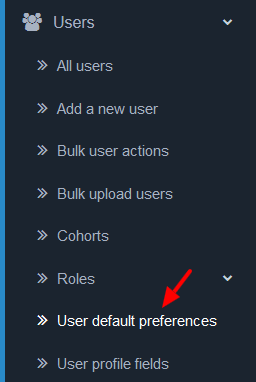 Before getting into specific actions to user accounts you might want to quickly check users’ default preferences as these settings will be given for every account by default. Location settings: These are location and timezone default settings, it can be accessed from left navigation Settings->Location. You should check up Default timezone, Default country and Default city and leave everything else as default. Also, if you would like to add new custom profile fields, jump to Users->User profile fields and explore this detailed guide. As we covered in the previous guide Authentication and enrollments methods, ScholarLMS by default uses email-based self-registration authentication method. 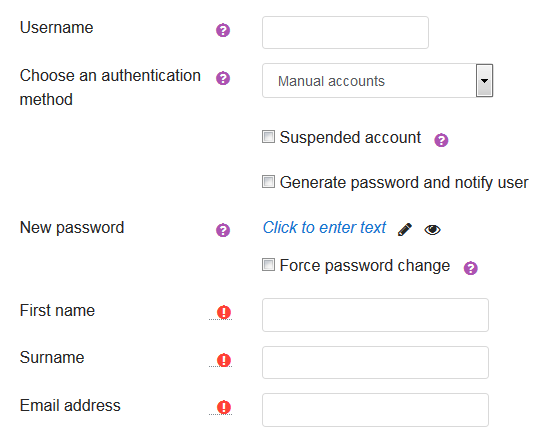 This method enables users to create their own accounts via the ‘Create new account’ button on the login page. There are two ways to add learners manually, adding one learner at a time, and bulk uploading several learners at a time. i. Adding a new user: To add a new user go to Users->Add a new user, this will open a new page. Username: The user will use this username to log in to your site. It needs to be unique. Suspended account: Leave it unchecked. Generate password and notify user: The system will generate a temporary password and email the user with instructions on how to log in and change it. New password: You can set a password for this user only If “Generate password and notify user” is unchecked. Force password change: It is highly recommended to force user to change their password upon next login. Now fill-up user’s first name, surname and email address. And you can leave all other fields as default. ii. Bulk uploading users: For bulk uploading users, go to the left navigation Users->Bulk upload users and follow through our detailed guide on it. In our previous topic, we discussed all the necessary enrollment methods that you are going to need for learner enrollment to a specific course. Let’s find out how it really works. Step 1. Select the course to which you want to enroll users/learners. Step 3. Click on Enrol users button, and you will see a new small pop up window where you can type which learner you want to enroll. Once done, click on Enroll users button appears at bottom. 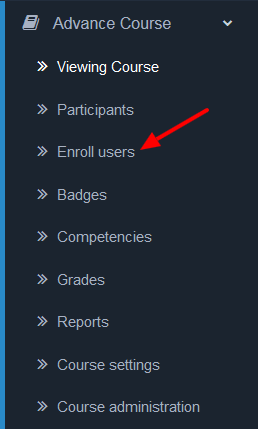 This allows users to enroll themselves to a course, either directly or via an enrollment key (“course password”). Step 3. Enable the Self enrollment (student) by clicking on the eyeball icon, and then click on setting icon, you will see the Self enrollment page. Step 4. Fill-in all the details and most importantly, fill the Enrollment key which acts like a password for accessing a course. When eCommerce is enabled: If you have eCommerce enabled in your account, the learners will be auto-enrolled to the course once they purchase the product successfully. Without eCommerce: The learners will also be auto-enrolled if they purchase a course from the LMS by PayPal method. In a course, go to Course administration->Users->Enrollment methods. If you do not see PayPal, use the pull down menu “Add method” and select PayPal Make sure PayPal has its “eye” opened. Cohort sync is for automatically enrolling members of a cohort in a course. 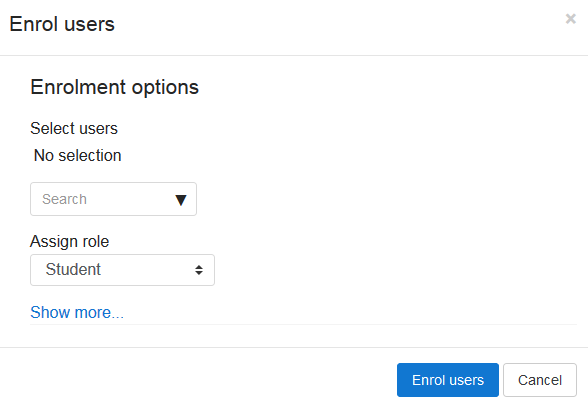 If a user is added or removed from the cohort, they are automatically enrolled or un-enrolled respectively. In other words, cohort sync synchronizes cohort membership with course enrollment. In a course, go to Course administration->Users->Enrollment methods. The Cohort Sync method will not be visible until you have added at least one Cohort in your site. To add a Cohort, go to Users->Cohort and then Add a new Cohort and return back to the course. 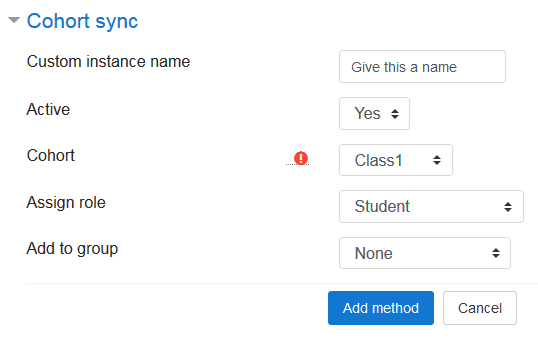 Once you add Cohort sync method, the next page will ask Cohort ID, user role to be assigned and any course group that you would like this Cohort to be enrolled. If you want to assign a site-wide roles to a user you can use Assign system roles feature. Here is how you can do it. Step 2. You should have Assign roles on the System page. From this page, you can assign roles to individual users. Let’s choose “Manager” as an example. Step 3. Assign the role of ‘Manager’ on the System page will open. You should see two columns, left column shows the existing users and right column shows the potential users whom you can assign this role to. Step 4. Select the users from Potential users column and click on Add button. The added users name will show on the Existing users list.